In any book you get the results of the planets placed in signs (mesha, vrishabha etc), planets in houses (lagna, 10th house etc) as well as the results of the lords in different houses ( lagna lord in the 7th etc). The planets in the signs yield (12x9=)108 combinations; and so planets in houses 108 combinations. The lord (owner of the house) in different bhavas give (12x12=)144 combinations. In other words, before you proceed to read a chart (may be your own) you have to master 360 sets of results that flow. One should not be in the habit of looking into the guide books each time. This will TARNISH intuitive abilities. First of all, you have to master the 360 key combinations and THEN ONLY proceed to examine individual charts. Normally, a student will go well when he is in the first set i.e. 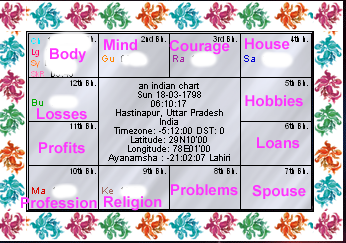 planets in rasis and immediately he opens his chart for verification. He is disheartened if the results are not applicable to his chart and he gives up the study of astrology -an unrealistic bogus science! Suppose he finds something applicable to himself, he would proceed further- to planets in houses. With some difficulty he learns to count the houses --clockwise or otherwise, different chart styles etc. If he drops at this stage, it is because he concludes - astrology is a mystic science and he could not master! In my experience as the ICAS faculty, I find that 6 out of 10 drop out at this stage. The great four proceed studiously to the effects of lords in different houses. More mathematics is involved here, either they learn to make charts PERFECTLY or depend on some readily available soft wares that are recommended by their guru or friends - (they do not know how to verify the accuracy of software at this state). They would commit all the 360 combinations into their memory. By this time they have already consulted their own horoscopes out of curiosity or have checked the results in different charts. They become strong supporters of astrology and also have sufficient knowledge to distinguish a good astrologer from a quack. If they drop out at this stage, it is because they did not have much time or advanced books to proceed further. This page does not intend to be a replica of some basic books on the subject. I desire to clear the confusions one gets while traveling through his chosen book. The topics in this section are based on questions my learned clients have raised. I suggest the REVERSE approach. Nowadays so many soft wares have come up. Make a chart having 3 boxes (horoscopic divisions). The bhava chakra should be in this. You need not have to know which ayanamsha is applied or the programmer's method of preparing the bhava chakra, at this stage. The experiment is tentative only. As you get sufficient knowledge of astrology, you may dismiss this software and go for the any other by choice. In the last stage, you learn of the houses where the planets are happy, unhappy, powerful to good or bad etc., You should remember that all these invariably go into analysis. Nothing is unimportant. When you study in reverse order, you have started with a specific, more decisive argument. This gives you more encouragement in learning. Earlier, you found only a couple of 'facts' applicable to your chart, but in the reverse order you will find many facts EXACTLY applicable to you. Being encouraged, you will proceed further and you will not be in the gang of six who drop out! Oh God, I have made you an astrologer! Now, my problem begins - I will have to devise ways to see you don't set up your 'future shop' near me! We, astrologers do not teach others - guard the knowledge and thereby secure it with handful people. There is no free flow of information except in astrological conferences. So, make it a point to attend such astrologers' gatherings and read astrological magazines.